By the time the colonial settlers were setting boundaries for their territories in the New World they were already aware that far to the west this chunk of land ended at the Pacific Ocean. Both the Spanish and the French were exploring large tracts of what would later become the United States, and explorers reported back such discoveries as the Mississippi River, the mountains, the deserts – – – and the Pacific Ocean at the end of the line. So the territorial governors, eager to make their claims on as much land as possible, frequently defined their holdings in an ocean-to-ocean description. Early maps drawn in the 16 and 1700’s showed territories starting at the Atlantic ocean and stretching across the entire nation. 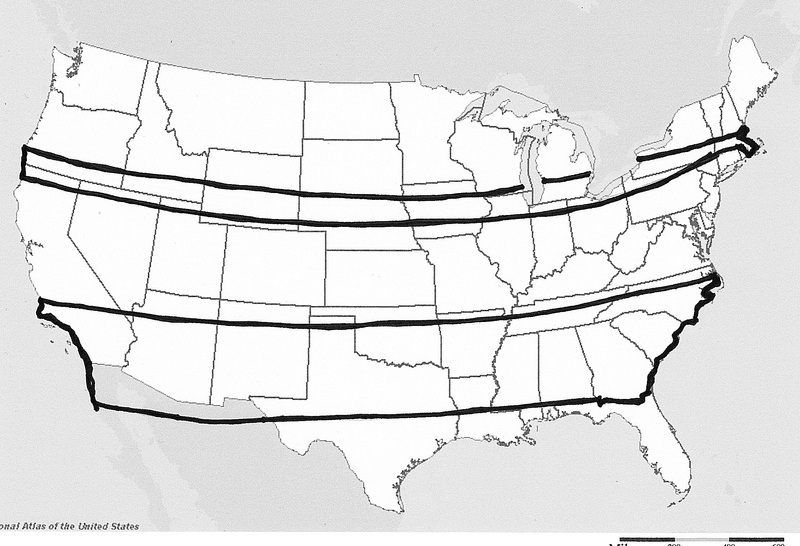 In this (pretty crude) example, the top lines represent the Connecticut territory, as seen by Connecticut settlers. The bottom represents The Carolina Colony, long before there was a North or South Carolina. They may have had to haggle with their neighbors over the northern and southern ends of their new territories, but looking west there was no end to what they imagined was theirs. Native Americans were not asked for their input. Once populations in the original colonies began to grow and people started moving west, Congress made the decision that these long territories needed to be divided up. It was easier to govern a more contained area, and Congress was determined to keep things fair between the states so limiting their size was important. The strips of long states were retracted to stop at the Mississippi River because France and Spain made claims to the west of it, borders were redrawn and smaller states began to be carved out of these endless territories. This entry was posted in Uncategorized and tagged Carolina Colony, colonies, Connecticut, Pacific Ocean. Bookmark the permalink. Defining their holdings in terms of “ocean-to-ocean” descriptions was a new concept for me. Every time I visit your blog, I learn something new–thanks so much!